In the application menu LibreOffice has no icon. How can I add it to it? 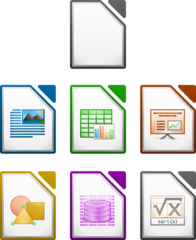 The Icon shown is the LibreOffice icon. What you are seeing is in fact the correct icon for the LibreOffice suite. Find an app in the Finder, usually in your /Applications/ folder. Drag the icon file you want to use onto the application's current icon on the top left. Press ⌘V to paste the image. If you would like to restore the application's original icon, simply click on the application's icon in the Info panel and press ⌘⌫. This will remove the custom icon. If you want to do this for many applications, or you need to do this relatively often for a program which keeps on resetting its icon due to frequent updates or any other reason, you can save a lot of time using a free, lightweight tool called LiteIcon. As with the manual method, to restore any application's original icon, simply click on the application's icon in the Info panel and press ⌘⌫. Alternatively you can go into LiteIcon and drag a custom icon "off" an app, which will also restore the original icon. Not the answer you're looking for? Browse other questions tagged macos icon . How to add a quick-launch icon in my Dock for a program I've downloaded?